Border Town #1 review: Bienvenidos a Hell – AiPT! Border Town tackles the twin terrors of immigration and monsters from another dimension. Comics are an escape from the ugly realities of the real world. Battles between superheroes and their arch rivals have long been a part of the histories of DC and Marvel. DC Vertigo is supposed to be a little different. While there’s still conflict between the forces of good and evil, Vertigo comics are intended to be a more “mature” brand of comic that allowed more freedom to creators. 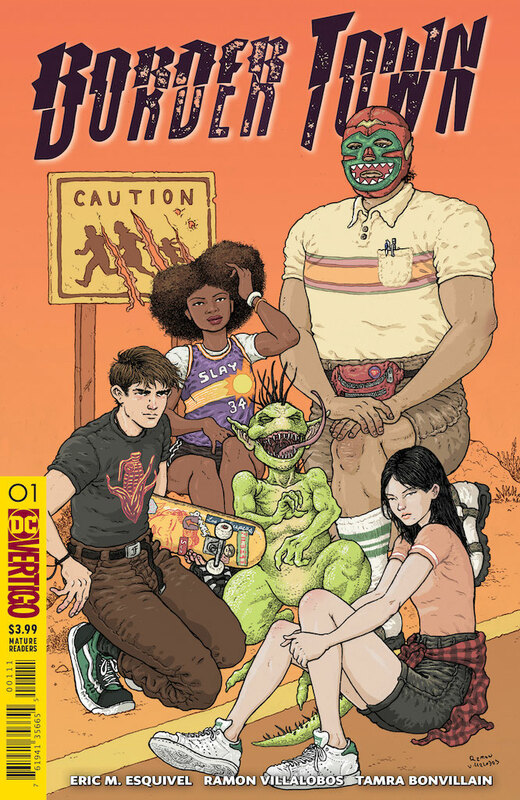 Written by Eric M. Esquivel and drawn by Ramon Villalobos, Border Town tackles the twin terrors of immigration and monsters from another dimension. Esquivel does a great job of writing a fun story. What separates Border Town from other comics is there aren’t really any jokes so much as there are moments. The premise alone gives an idea as to the type of humor readers are dealing with: in the border town of Devil’s Fork, Arizona, a rash of odd happenings such as mysterious goat mutilations are blamed on illegal immigrants. Esquivel does not force comedy; instead, he allows it to just happen. The entertainment found in Border Town is not just due to its free flowing, humorous tone, however. This is a comic book about monsters that have crossed over from another dimension, after all, and it’s appropriately action packed. The opening sets a tone that will stay with readers for the remainder of the story, and the battles are violent and keep the story moving. Balance can be a difficult thing in comics — action can either supersede character development or feel out of place. Esquivel manages to provide insight into the characters while delivering great fight scenes — sometimes doing both at the same time! Being this is the debut issue, readers only get an idea of what the characters are like, but that little bit is enough to engage people. The art from Villalobos is stunning. Characters are exceptionally detailed and their emotions can be clearly seen, even in the simplest moments. For example, when we first meet Aimi and Julietta, they are simply two high school students sitting around and talking. In one seemingly unimportant panel, Villalobos captures the essence of two young girls gossiping about the new kid in town. Esquivel recently said in an interview with AiPT! the new book is intended to be a horror series, so monster design is very important. Villalobos does a frighteningly wonderful job. From the first creature introduced in the first few pages to the famous figure of Mexican folklore met at the end, the creations of Villalobos are original and scary. The care and effort put into each character is obvious and adds to the enjoyment of Border Town. In the aforementioned interview, Esquivel stated he wanted people to see Border Town as more of a fun horror story than a politically charged one. When dealing with immigration, undocumented workers, and fitting into society, it’s hard to dismiss the political nature of the comic. This does not mean that the book is not entertaining, however. On the other hand, it makes it that much more satisfying. Instead of a strictly political message, Border Town is a fun horror story that happens to have political overtones. How well do Esquivel and Villalobos capture what it is like to live in a border town? I live in El Paso, Texas which is right on the border of Juarez, Mexico. I can get in my car and be in Mexico within twenty minutes. I have lived here most of my life and have a grasp on what Border Town is trying to convey, and it does a great job. From people complaining Mexicans are holding back El Paso, to others not trusting any guerro, to the art that is somehow filled with color despite being surrounded by a seemingly bland landscape, Devil’s Fork could just as easily be El Paso. Border Town is an excellent release from DC Vertigo that knows how to have fun while also delivering its message. The well written and drawn book is a great read for any comic book fan. A horror story that contains a deeper message, Border Town is a fun comic filled with action and humor.